In addition to the talent competitiveness ranking, this year’s report investigated the theme of ‘Diversity for competitiveness’. Three types of diversity were distinguished: cognitive, identity and preference (or value). The theme of diversity (collaboration between people with different personalities, knowledge sets, experiences and perspectives) was chosen because it plays a critical role in linking talent policies to innovation strategies. Paying attention to demographic diversity nurtures a sustainable and innovative future and helps organizations to retain and develop talent. Nevertheless, the report highlights that there is a cost to diversity: people are often ill equipped to collaborate with others who are different from themselves. Switzerland maintains its number 1 position, followed by Singapore and the United States. 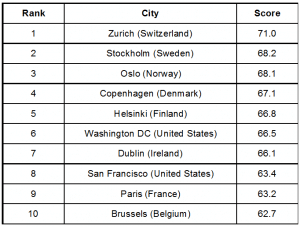 European countries continue to dominate the GTCI rankings, with 15 of them in the top 25. Among the non-European countries ranking high this year, are Australia (11th), New Zealand (12th), Canada (15th), the United Arab Emirates (17th), and Japan (20th) for example. Latin America often leads in producing female graduates (Argentina ranks 5th on that variable). The index assesses the policies and practices that enable a country to attract, develop and retain both ‘Technical/Vocational skills’ and the ‘Global Knowledge skills’ associated with innovation, entrepreneurship and leadership – the talent that contributes to productivity and prosperity. GTCI findings, however, show that there is no absolute model for diversity and inclusion. Switzerland, for example, does not score as well as its top GTCI position would imply on leadership opportunities for women. The Nordics score remarkably well on most variables related to collaboration, internal openness, social mobility and gender equality, but they struggle in external openness, and hence in attracting talent.